All too often, we are forced to choose between the traditional forty-plus-hour workweek and unemployment. Yet, tremendous opportunity lies in the middle, in The Third Option. 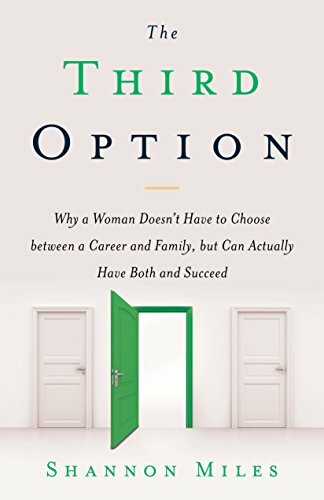 If a rigid, corporate environment is consuming your life, or you’ve left the workforce and miss being a professional, you can craft your own Third Option. You will need to dream bigger, decide to make a change, and do something about it! You can offer your skills and talents to companies and clients on your own part-time schedule and create the work/life balance that’s best for you. In The Third Option, Shannon Miles shares how she took a leap of faith to create a flexible career that gives meaning to both her work and her family, and she shows how you too can accomplish the same. Whether you want to be a contractor or freelancer—or change an existing position into a job that meets your needs as well as the company’s—you can work virtually at home and still make a living. More importantly, you can live and work on your own terms.